Baithong Restaurant took the first place during a simple pleasure competition searching for that perfect pastry that we indulge most of the time. The panel of judges from various groups such as Jerome (Cellier D’Asie), Chef Takashi (La Residence), Chef Ludo (French Embassy), Guillaume (F&B Consultant), Dara (Sundara International) and of course myself felt that the competition was interesting as all of us came from different background and taste. There's no shortage of restaurants around the Russian Market. You'll find quite a few western cafes, like Café Yejj and Yellow, as well as the cheap market stalls in the market and plenty of off-road local spots dishing out the ubiquitous rice and soupy meat. But the new Vitking House vegetarian restaurant seems to be one of a kind in this neck of the woods. It possesses the western amenities of air-conditioning, comfortable seating and free wifi, but is priced like a local eatery..
in the comfortable yet stylish feel of a modern chic home. There is an excellent play room downstairs, great bathroom facilities (including a change table and bath/shower for toddler accidents) and air-conned rooms that can be hired for meetings. The food. I have to confess up front that I'm not an organic eater at the best of times, but this was wonderful. THE BALCONY Gastropub opened its gates just in September 2010, but has quickly gained a reputation for great food, very reasonably priced drinks and a great atmosphere. As proof of this, the place is packed every night! Very popular among local and foreign business people working in Makati, the mainly young crowd keeps this place busy, often until the wee-hours. Try their CREPES! Jimbaran is known as the ‘golden mile’ because of its great white sand bay and selection of high end resorts. Real estate in the area is premium and no wonder, with access to the beach, the airport and Kuta, not to mention the surfing beaches on the Bukit peninsula. One of the cool things to do when on holiday in Bali is to eat grilled fish on the beach at Jimbaran Bay in the evening. Though not the bargain it once was, visitors love it because its a unique experience. You mention the word ‘Jimbaran’ anywhere in Indonesia and people often will make the connection with grilled seafood. For anyone looking for a relaxing space for a fantastic meal that is probably the best value in Phnom Penh , I can highly recommend Aussie XL Cafe. This place deserves an honest and decent rap.I have eaten there 3....no....4 times there in the last 6 weeks and every time has been pure joy. What a typical, virgin Westerner arriving in Cambodia imagines about its food we - I guess - all know. Pol Pot, genocide, famine and poverty - that picture of Cambodia is still the only one for many in the West. I wasn’t different, to be honest. When I first arrived in Phnom Penh I barely expected something more than typical, never ending Asian street food feast I knew before from India and Nepal. Well, I simply forgot I was coming to a kingdom. And a royal welcome I received. 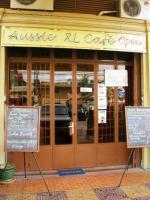 This is possibly one of the best culinary finds in all of Phnom Penh. I love it so much I have eaten there 4 times in the last 2 weeks. This Singaporean restaurant is simple,clean,friendly and incredibly cheap. Although it is a bit of a hike for Riverside yuppies, it is WELL worth the trip over to Olympic Stadium – especially for a group night out. Chicken feet may not be to everyone's taste, but true dim sum lovers will understand the joy of finding melt in the mouth stewed poultry feet at an ungodly hour. But less adventurous diners need not panic. At Mekong Village Restaurant on Monivong Boulevard's northern Chinese restaurant strip, the choice doesn't end there. I have a good idea. How about go to Thailand, go to an American style luxury shopping mall, and then eat some Japanese hamburgers? That is exactly what I did when I went to the Japanese burger chain Mos Burger in the Siam Paragon shopping center. Back in San Francisco, living across the street from a Thai restaurant, eating Thai food more than once a week was completely out of the question. Fast forward 3 months and I live in Bangkok and eating Thai food is a daily occurrence. Sometimes Thai food is on the menu multiple times per day.